Hi folks. Things around here are waaaaaaay to quiet for my liking, so I think we need to stir things up to start 2013 with a whole bunch of Jugs on everybody's benches. 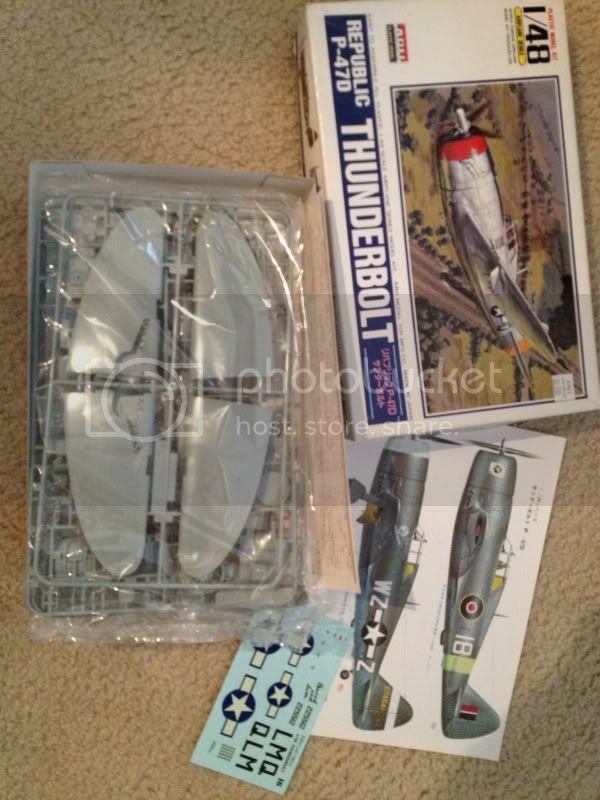 I am proposing an open P-47 group build, any scale, any variant, any nationality and theatre, pretty much whatever you want as long as it's a Thunderbolt ! If we start on January 1, and run it for 8 months, there is a slim chance that Nige and I might even get a chance to contribute something for a change. Please note that I said MIGHT ! Anyway, who's up for it ? I think that's enough to formally open proceedings here, I'm sure we will pick up a few extras along the way. Come on folks, let's get some more Thunderbolts out of the stash and onto the bench ! I am in, Damian. Got a ton of Jugs in the stash and a ton of decal sets since I can never decide what markings to use. Edit: In the interest of getting as many contributors as possible, I am going to allow "Hangar Queens" for this Group Build. Line them up guys and gals, let's get some action going for the new year. I'm going to say that I am in I have a 1/32 P-47 up to the painting stage, if that's allowed? I aim to build it as "No Guts-No Glory" so I have to crack the masks for the nose checkers and that will probably take some time though. I'm happy to allow started kits for this Group Build, the more people contributing here the better. Any hints as to the kit and scheme you're working on ? Thanks for joining in mate. I will probably build one of the Monogram kits. Either the razorback or the bubbletop. WHAT? No Matchbox this time? The Mayans may be right ! Bump time again folks, since the world didn't end we can move forward now. I've had a couple of requests for a later start, and that might help to rally more troops, so we are now looking at a Feb-Sept 2013 run time for this Group Build. The enlistment page should be up shortly, so I will link it here. 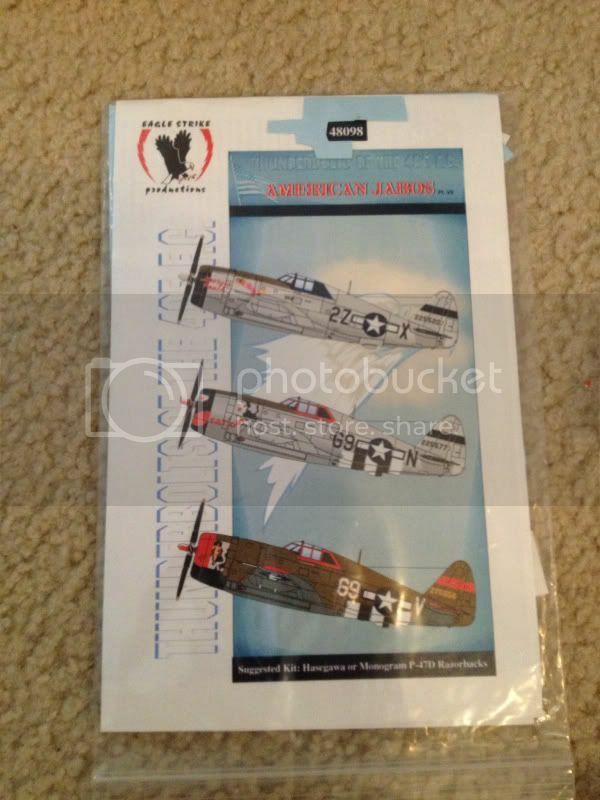 Ive had a P-47 project in mind for a while, and this nice 1/144 twin pack. The proposed September end date looks good to me. 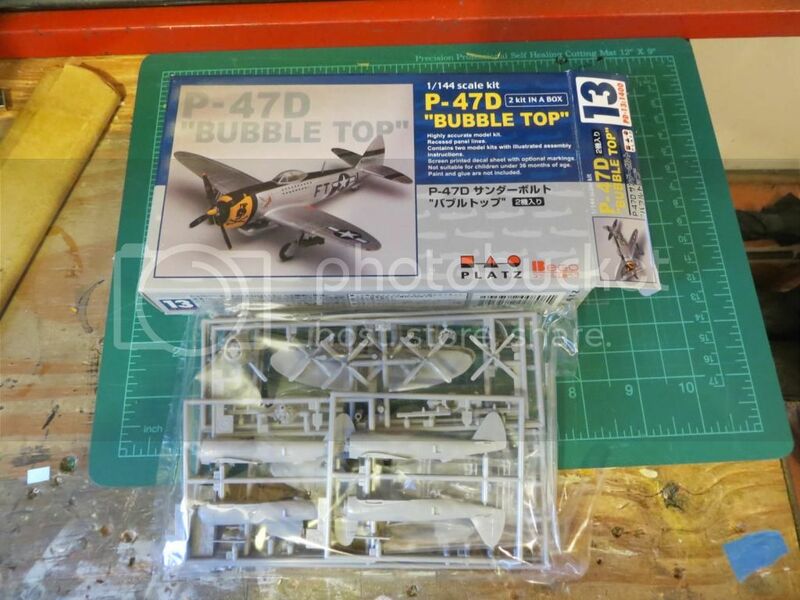 I'm also hoping some of you jug heads might be interested in building a C-47 to go with your P-47s. Jonathan, it will be great to have you on board mate, those uber-Braille scale lil' Jugs look great! Nice shameless self-promotion as well. I've been watching the C-47 thread all along and it promises to be a fascinating Campaign with some uncommon builds in the mix. Thanks for posting up here. Ok since Sam volunteered me I'm in. G'day Tomcat, thanks for the confirmation. Always great to have you on board ! In the interest of getting as many contributors as possible, I am going to allow "Hangar Queens" for this Group Build. Line them up guys and gals, let's get some action going for the new year. Please note that the title has change to avoid confusion with the Aeroscale Campaign already set up and enlisting by Camogirl. We are now "Thunderbolts Are Go (2013)!" I just cracked open and painted the cockpit on the Otaki Razorback. I'm treating this is a late entry in a second Pin-ups since she will be wearing the Miss Second Front pin-up. Welcome aboard D, thanks for enlisting. I'm looking forward to watching the Otaki kit come together, I have built a couple of their kits in the past and they build up quite well. Merry Christmas guys, here's to an awesome 2013 for us all. We have a good diversity of builds proposed already, looks like a fun time ahead. Yeah Michael, we take things sloooooooow and easy around here. It would be great to have you on board and see that Hase kit finished off and on display. OK, you talked me into it. That's four campaigns for 2013, two of which I'm leading. Oh boy! Up to 12 enlisted now, thanks for joining in guys. Less than a month to go now, we will use this thread for the duration of the Group Build, so please start posting pictures of your proposed builds or the current status for in-progress builds whenever you like. Here is my kit for this campaign. An old Arii P-47 razorback. Strangely enough the decals included in the kit does not fit the color schemes included in the instructions. Does not really matter anyway as I will use other decals. 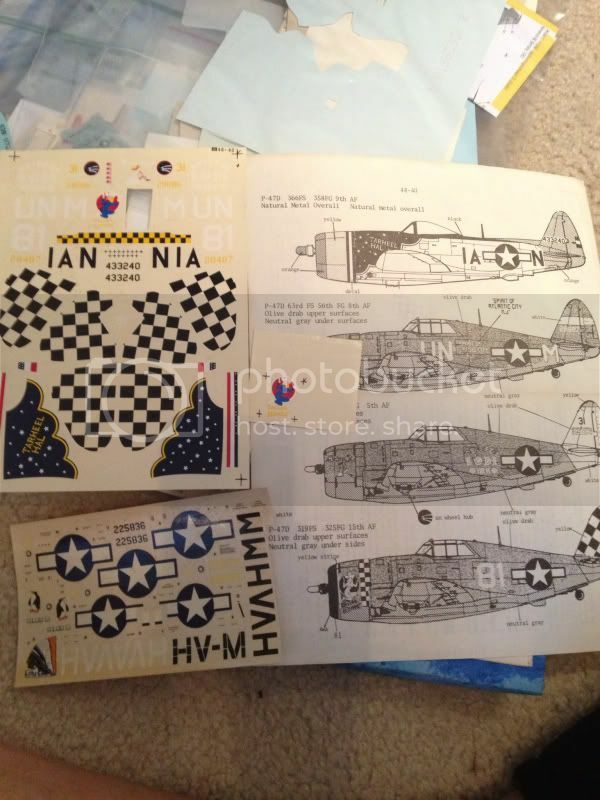 Currently have one well underway (P47D "Super Rabbit", Barracudacals,BC48039 Mogin's Maulers! P-47s of the 362nd FG, so will not enter for this group build. Another one from same decal sheet "Five by Five" for starters.